I am a firm believer that not just anyone is capable of doing any job. Personality plays a big part. Take call centre customer service for example. I worked in the phone banking department of a major bank for a year and a half. It was a year and a half too long. Taking up to one hundred calls per day from mostly irate customers taught me that I am just too nice. Yep, it is definitely a job that requires a thick skin. The calls I got ranged from account queries to bank statement orders to interrogation into why the bank has spent over $300 of the customer’s money in bars on George Street. It was often my fault when Jim bought the whole sales team shots, when casual Friday night drinks got out of control. Another bugbear for clients was the obligatory security questions that we would ask. Apparently ensuring that we are speaking to the correct customer and protecting their investments is a bad thing. Perhaps the fact that people are hiding behind a phone makes them braver than they normally would be. I have been cursed at and threatened. I have been hung up on more than one occasion. One customer made the grim discovery that her drug addicted son was stealing from her when I informed her of unauthorised transactions on her account. It was at this point that I realised that I no longer wanted to be the constant bearer of bad news. I was taking my work home with me; a bad day on the job ensured that I was going to have a bad night’s sleep. That braveness on the phone I mentioned worked both ways. I had a colleague who relished a good argument with a client. She gave as good as she got and would often mute the call so she could have a good giggle. It was horrific to watch. The lady in question was overly amorous with the makeup palette so watching her silently cackle with glee at the shouts of an angry customer was like watching a killer clown in a slasher movie. The mute button is a great friend to all the call centre customer service agents. It provides a brief heavenly moment of escape when we can curse or cry. Some agents even throw stuff. I think it is a career that requires a very strong willed person. For the ambitious amongst us, it offered many opportunities for climbing the corporate ladder and we were constantly encouraged to apply for senior roles. The social aspect of the position was like nothing I have ever experienced with other jobs. The call centre was a large open space office with five seater work pods scattered across the room. During lulls which we would experience on late nights or Sunday mornings, there was great banter within the teams. Drunken nights out were commonplace also. It seems those in customer service like to party. There was the sales aspect of the job that people either loved or loathed. We were required to promote our suite of products to the customer, from insurance products to home loans to credit cards. It took skill or maybe just common sense to know when and definitely when not to go in for the sales kill. The brave amongst us had no qualms about offering a customer the opportunity to apply for a home loan right after the customer had complained to them about interest rates. I often found myself cringing on their behalf. 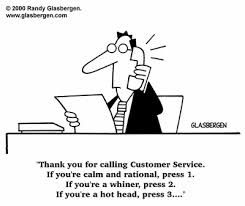 Yup, working in customer service is not easy! For all of its faults, working in a call centre had its fair share of perks. Being able to file my nails at work was a bit of a dream come true as was reading girly magazines when the phone was quiet over the weekend. Sometimes, just sometimes, I would receive a compliment, usually off a sweet old lady just looking for a chat. That recognition for my efforts on the phone was usually enough to eradicate all thoughts of the nasty phone calls I received during the day. If this didn’t help, the cash incentives from management usually did the trick. Spare a thought for the boy or girl that you phone in the bank next time. You might be angry about some transaction or another or bank fees but please do not shoot the messenger. We unfortunately get paid to give bad news. And lest forget, you are just one of hundreds on hold waiting to wring our necks. Have you worked in customer service? What are your experiences? Vent your spleen below!